The Category and Sub Total Category pct’s are incorrect due to Brand B having a Target but no Actual Total. This Target is being counted in the Variance at Sub Total and Total Level but shouldn’t be. 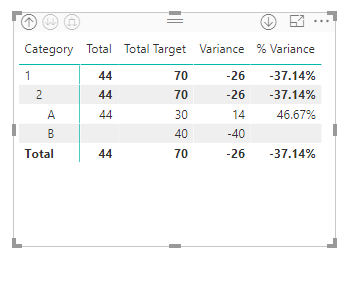 How do I tell the Variance Measure to ignore any Target that doesn’t have an Actual Total. Sorry to have not replied earlier but I didn’t get a message saying I had a reply. The B Target had to be considered and I wanted it to be displayed as well. No problem at all, as long as you got your solution. One thing to keep in mind ( and might not even be an issue) is that at the total level the numbers can easily be misunderstood. 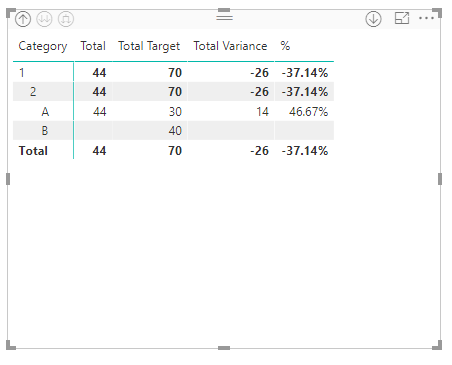 For example, if a user looks at the Grand Total row and sees Total of 44, Total Target of 70 and the Total Variance and % do not match those figures. Just something to keep in mind when looking at the final output. Like I said, might not be an issue for your end users who know your data. That’s me being a pillock and not concentrating. Thinking about it I was actually correct in the first place.